Unless you intend to only stream live video to the web, you need video editing software. To be specific, you need a nonlinear, computer-based editing system that can ingest, edit, and then save video files for distribution online or via DVD/Blu-ray. Although theoretically you could go the freebie route, producing quality videos requires a serious editing suite. Candidates to consider include Adobe Systems, Inc.’s Creative Suite 5.5 Production Premium (CS5.5), Apple’s Final Cut Pro X (FCPX), Avid Technology, Inc.’s Media Composer 6 (MC6), Grass Valley USA, LLC’s EDIUS 6, and Sony’s Vegas Pro 11. This article will touch briefly on the benefits offered by each program. Before we begin, it is wise to consider some general points about nonlinear video editing, specifically in terms of defining and then fulfilling your particular needs. First, determine in what kinds of video file formats you will be recording raw footage. The variety of video cameras on the market means that there are all kinds of recording formats being used. These formats may be proprietary or open, but even the open standards won’t necessarily work with your video editor of choice. So take a hard look at what you are shooting with today—and may be shooting with tomorrow—before making your decision. That’s not all. If you ever intend to use footage shot by other camerapeople and/or to use stock footage in your productions, your editing system must be capable of working with these formats as well. Some editing programs cope with varying native formats by supporting them all; others transfer incompatible native formats into formats they can work with. Any time you convert something to another format, you risk losing data and injecting errors. If at all possible, choose an editing system that works with a range of native video formats. Performance is another consideration. It is better to buy a high-end program that does lots of things efficiently than to save money on a budget-priced editor that chugs along on your workstation. It may be important to have editing software that supports multiple users in real time without choking—but only if you intend to let multiple users access the same video files simultaneously. You should also think about audio production, effects production, graphics, and all the other elements that are employed to create professional-grade video. Will the editing system you’ve purchased play nicely with these systems, exporting data to and fro without headaches? Or will it creak and crash every time you try to bring in other elements? Then there’s hardware. Will you be able to run the editing suite on your existing equipment, or will you need to upgrade? For high-end equipment, you will need to buy workstations designed to support the workload. Are you prepared to do this? Give a thought to storage. Where will the finished videos go once they are done? Does your preferred editing suite integrate to video servers and other archiving systems? And what about streaming? Will your editing system produce finished videos in the streaming formats you want? Or will an additional step have to be factored into the production process? If you answer all of these questions first, chances are you will be ready to make an informed decision about which editing system to buy. But don’t just jump at the first appropriate solution you see: Take time to talk to the vendors to see what they have to offer. With a little homework, you can end up with the right editing system at the right price and with room to grow in the future. Now that you have these answers in your mind, let us consider the five editing suites mentioned at the outset of this article. At $1,194 at www.bhphotovideo.com, CS5.5 may seem a bit pricey for the newbie editor. However, this price delivers a profoundly capable 64-bit platform. Besides including Adobe’s Premiere Pro video editor, CS5.5 comes with After Effects (special effects), Photoshop (image editor), Audition (audio editor), Flash Catalyst (interactive Flash content), Flash Professional (Flash authoring), Illustrator (graphic design), Media Encoder & Device Central (creating content for mobile devices), OnLocation (metadata), Encore (DVD authoring) and Bridge (file management). 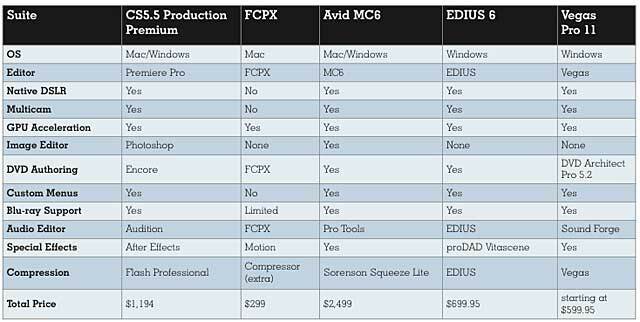 In other words, when you buy CS5.5 Production Premium, you are buying a multifaceted image production system. Final Cut Pro is a legendary name in nonlinear video editing. At $299, the latest edition of this software, Final Cut Pro X (FCPX), is an entirely new version (and one that received a less-than-warm welcome from longtime users). It is a 64-bit package that has freed itself from the tape-based heritage of nonlinear video editing, resulting in improvements that speed up the editing process. For newbies who want to take the plunge into video editing on a Mac platform, who are not tied into older ways of things, and who do not need the wealth of extra features found in a CS5.5, FCPX is worth serious consideration. At $2,499, Avid MC6 is the most expensive of the editing suites covered in this article—but it is expensive for a reason. This new 64-bit system is a fully professional platform that can even edit 3D stereoscopic video. Avid has also made MC6 compatible with third-party I/O devices (AJA, Blackmagic Design, Bluefish444, Matrox, and MOTU), which can save you money when it comes to buying hardware. Avid Media Access also lets users instantly access and edit file-based media from RED and RED EPIC, new AVCHD, ProRes, QuickTime (including footage from HDSLR cameras), Sony XDCAM, Panasonic P2, Canon XF, and other formats—without transcoding or importing. There’s a host of other features in MC6. Simply put, this is an editing software system for people coming in at the high end of the game. This $699.95 nonlinear editor is a 32-bit package that can nevertheless run on 64-bit Windows platforms. In terms of features, EDIUS 6 supports a range of video formats, including native support for Sony XDCAM, Panasonic P2, Ikegami GF, and Canon’s XF and EOS movie formats. It can also manage multicamera editing from as many as 16 sources at a time; it provides real-time effects, keyers, transitions, and titles. Generally, it has the audio/video capabilities needed for professional editing. With prices starting at $599.95, Sony’s Vegas Pro 11 editing software is available in 32-bit and 64-bit versions. Its claim to fame is its ability to work with 3D stereoscopic footage. The software comes bundled with DVD Architect Pro 5.2 and Dolby Digital Professional Encoder, and it provides GPU-accelerated performance for OpenCL-supported devices. In terms of capability, Vegas Pro 11 is a high-end prosumer/consumer application—with 3D editing power. All of these descriptions are basically thumbnails. To truly grasp the capabilities of any video editing software, buyers need to do in-depth research online, plus talk to actual users. The point being made here is that there is a range of price and performance options available. Picking the right editor for your needs is based on balancing current needs and potential future requirements with price and software usability. Parallel encoding in Adobe Media Encoder and unlimited multicam highlight the enhancements in Adobe's latest version of Premiere Pro. 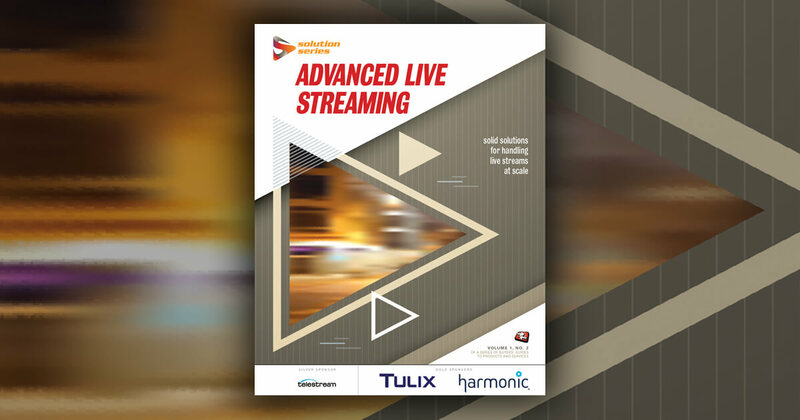 We're growing the Streaming Media brand with Streaming Media Producer and an expanded Buyer's Guide section in this year's Streaming Media Industry Sourcebook.